A remarkable place consisting of a cloister, the church of the Lord’s Birth, a Holy Hut and clock tower with a world famous chime that has been situated in Prague Hradčany for more than 300 years. Situated in Lesser Town is St. Nicholas Church, whose robust dome and thin bell-tower are an inseparable part of the Prague Castle skyline; it is one of the most sought after Prague churches. It belongs among the leading baroque constructions in Europe and is usually defined as being the most beautiful building of Czech baroque. The Church of St. Nicholas is one of the oldest churches in the Old Town area of Prague. It is mentioned in sources as early as 1273. 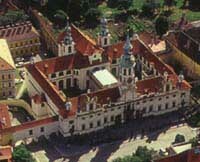 The plans were drawn up by the famous Prague baroque architect Kilián Ignác Dienzenhofer. 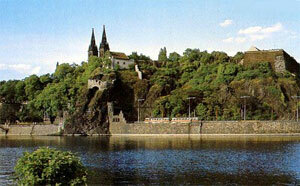 Vysehrad, the rock above the river with its dark outline of slender spires, is an inseparable part of the Prague skyline. The church is world-famous thanks to the Prague Bambino - Infant Jesus wax figure (of the Spanish origin), which was presented to the church by Polyxena of Lobkowicz (1628). The Church of Our Lady before Týn (Týnský chrám) is without doubt the most important ecclesiastical building on the right bank of the river Vltava. 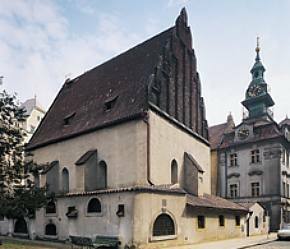 The Old-New Synagogue was built in an early Gothic style around the middle of the 13th centruy. It was originally called the "New" or "Greate" Shul to distinguish it from an older house of prayer which did not survive. It was not until the 16th centruy, when other synagogues were established in Prague, that it became known as the "Old-New" Synagogue. 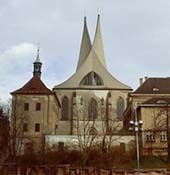 The monastery Na Slovanech with a church founded by Charles IV in 1347, the only Slavonic monastery in the west Christianity of the Charles’s empire, centre of scholarship and arts. 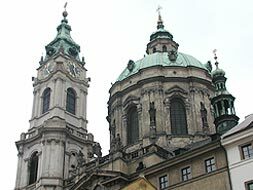 On 14 February 1945, during an American air-raid in Prague, the church was destroyed. Later on, a modern structure was installed. The smaller tower is a remaining of the Judith Bridge, built in the 12th century in the Romanesque style. The higher one dates from 1464 and is a representative of the Gothic period. The entrance gate to the Charles Bridge from the Old Town river bank. This aged gate tower, completed in 1380, is part of Prague's old fortification system. The gothic Powder Tower was built in 1475 by Matej Rejsek. Once it served as a gunpowder depot. The monumental tower was rebuilt in the late 19th century by J. Mocker. The oldest gothic part of the complex which includes a tower and an oriel chapel is richly decorated with coats of arms. It was built in the latter half of the 14th century. In the top part of the astronomical clock the 12 apostles appear every hour between 9 a.m. and 9 p.m. The tower of the late gothic style (1472 - 1476) built as a separate belfry of Italian model. After the fire in 1745 it was adapted in the baroque style and in 1870s rebuilt in a gothic style. A gothic complex of buildings from the late 14th and early 15th centuries, rebuilt in the renaissance style in the 16th century. It contains a tower with Our Lady Chapel, two gothic halls with ribbed vaults and a renaissance hall. 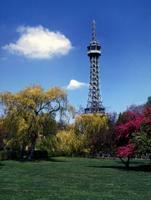 The iron tower, 60 metres high, was built by F. Prásil as a part of Anniversary Exhibition in 1891. It was conceived as a loose copy of the Eiffel Tower and it is cca 5 times smaller than its french preimage. View over Prague from one of the highest places in the city. 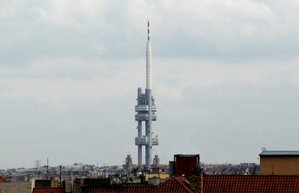 Television Tower Zizkov is the highest tower in the Czech Republic. It was completed in 1992. The structure is composed of three steel body tubes. In the main one, there are two personal lifts, one cargo lift in the second and a staircase in the third tube. A lookout cabin is situated in the height of 97 m.
The Golden Lane originated after the construction of the northern wall of the Castle. The area of the northern bailey was used for the building of modest dwellings, which are now the last remainder of the small-scale architecture of Prague Castle. From 1916 to 1917 house No. 22 was inhabited by the writer Franz Kafka. 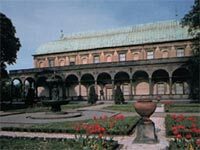 The Royal Summer Palace, also called Queen Anne's Summer Palace, was built to the order of Ferdinand I from 1538 to 1560 on the eastern edge of the Royal Garden. The Royal Summer Palace now serves mainly for exhibitions of creative art and artistic crafts. The Charles Bridge is one of the most visited sights in Prague. 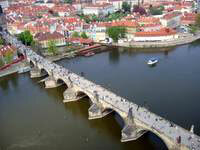 The oldest Prague bridge was built in the place of the Judita's Bridge that had been badly damaged by a flood in 1342. Its construction started in 1357 under the auspices of King Charles IV, and finished in the beginning of 15th century. The bridge was originally called the Stone Bridge or the Prague Bridge but has been the "Charles Bridge" since 1870. There are towers standing on each end of the bridge. 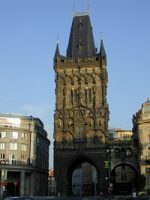 Both the Lesser Town Bridge Tower and the Old Town Bridge Tower can be climbed for a view of Prague and the bridge from above. The bridge is decorated by a continuous alley of 30 statues and statuaries, most of them baroque-style (M. Braun, F. M. Brokof, etc. 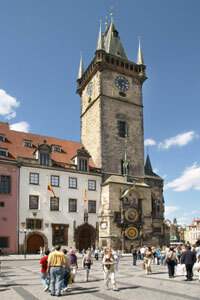 ), which were gradually placed on either side of Charles Bridge in the 17th century. The bridge is 515 meters long and nearly 10 meters wide.